It has been said that the way to a man’s heart is through his stomach. I can testify it’s true at my house. At least, it has been up until now. Like most men, my husband Ted loves a well-crafted meal. He appreciates everything from a bowl of slow-cooked beef bourguignon to a German bratwurst with sauerkraut and stoneground mustard. In fact, I’ve found that if he’s having a particularly rough day, my suggestion to order in favorites like chicken wings or Thai green curry after the kids are in bed goes a long way in lightening his mood. Lately, he’s battling what’s medically termed as dysgeusia. That would be a distortion of his sense of taste. Food tastes okay near the front of his tongue, but once it hits the back, it might as well have been sitting in the fridge expired for six weeks. Think of it as everything he eats having a flavor profile of “rancid” or “rusty metal.” As I write this, he’s into month two of this unpalatable ailment. Yeah, yuck. And I do mean, quite literally. The good news is that, as much as food speaks love to Ted, I know a more direct — not to mention less labor-intensive — way to his heart. One that isn’t related to his taste buds and doesn’t, like that beef bourguignon, take hours to make. It’s affirmation. Those spoken or written words of mine that praise him and his efforts. Whether it be for the hard work he puts in to provide for us, for the time he spends each evening reading N.D. Wilson books to our daughters, or for his prompt destruction of that pesky — and potentially dangerous — wasp nest outside our garage door. This isn’t a new revelation for me. I’ve known since the early days of our marriage that “words of affirmation” is Ted’s primary love language. Yet sometimes I forget just how much he needs to hear, “You da man!” And how often. He thrives on these words of praise enough that my lover of good grammar doesn’t even mind the butchering of the English language that comes with it. What about your spouse? Does affirmation feed his or her love tank? Does it fill them with a sense of satisfaction? 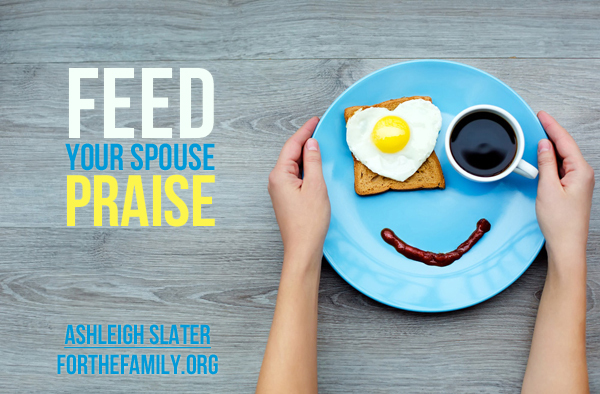 If so, pause for a moment and ask yourself this: How often in a given day do I intentionally stop to praise my spouse? To recognize and affirm his or her character or actions whether out loud or in writing? Many of us probably cringe at answering these questions. Me included. Because we know we could do better. I know I could. If you’re struggling to intentionally affirm your spouse regularly, here’s an idea. Tape the words of Paul in 1 Thessalonians 5:11 — “Therefore encourage one another and build one another up” — to some place you see often. Maybe your computer screen, the back of your iPhone, on your refrigerator, or maybe your Pinterest board. Then, each time you see this verse, stop to think of something you appreciate about your spouse. But don’t leave it with a mental note to yourself. If your spouse is present, tell him or her right then and there. Speak those words of affirmation. If he or she isn’t, send a text, leave a Facebook note, or pick up your phone and call. Who knows? 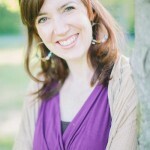 Your words of praise may go beyond simply feeding your spouse’s need for affirmation. They may serve as a pivotal encouragement on a rough day at work or at home with the kids. A kind of, as they say, chicken soup for the soul. And who wouldn’t say “Bon appetite!” to that? 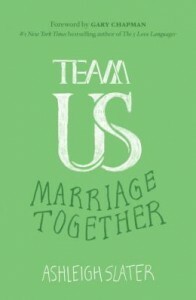 If you enjoyed this post, check out Ashleigh’s book, Team Us: Marriage Together. It releases June 1st from Moody Publishers and is available for preorder. Find out more here. Thanks for the reminder. I know this to me true. I will do this today. As a man, I wholeheartedly agree with this article. We’re simple creatures, don’t overthink it, ladies. A selfless, good man loves to please his lady and if you make us feel good about ourselves, you’ll get more out of us. That’s a selfish motivation, but it’s true. Conversely, we need to do our part to make you feel loved and appreciated as well. Thanks for chiming in! It’s fun hearing another man’s — in addition to my husband Ted’s — thoughts on this. Great reminder to speak words of affirmation to those we love, Ashleigh! great point, one thing to add: if you have children, BE SURE TO DO THIS IN FRONT OF THEM! 1) it builds up your spouse in front of their own children 2) Kids learn things about mom or dad they didn’t know. Lets face it kids do not know half of what parents do and sacrifice for their H/W, family, etc. This teaches the kids more about being a parent and being a spouse.